Meet Clay, Bob, and Bill Mason of the Circle-J Ranch – from Chicago, circa 1946. I will always remember them and the several other performers of the Circle-J western stage show. Why? Because that singing/performing group first opened my eyes, as a lad of age six, to the spark and excitement of live music and entertainment; it was my first taste, up-close-and-personal of the “sparkle” of show-biz! The experience was personal because Chuck Maitzen (“Clay Mason” was his stage name), his wife and two little girls were close family friends in Chicago. 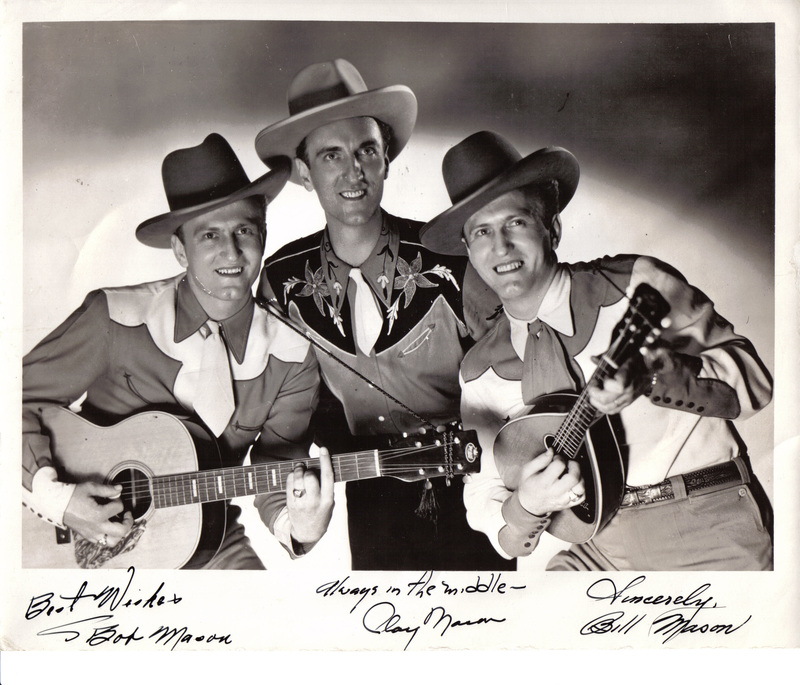 Chuck and his identical twin brothers, Bob and Bill, headlined the Circle-J western music show which performed regularly in the Chicago area; they also had a weekly program on a local Chicago radio station. Because my father had training in radio electronics during World War Two, Chuck asked him to operate the public-address system at Circle-J performances. I recall vividly the evening that my mother and I were in the audience at their performance in a local high school auditorium. Dad was working the public- address system for the show that night, as usual. I recall the footlights and the overhead lighting which bathed the stage in a brilliant light. 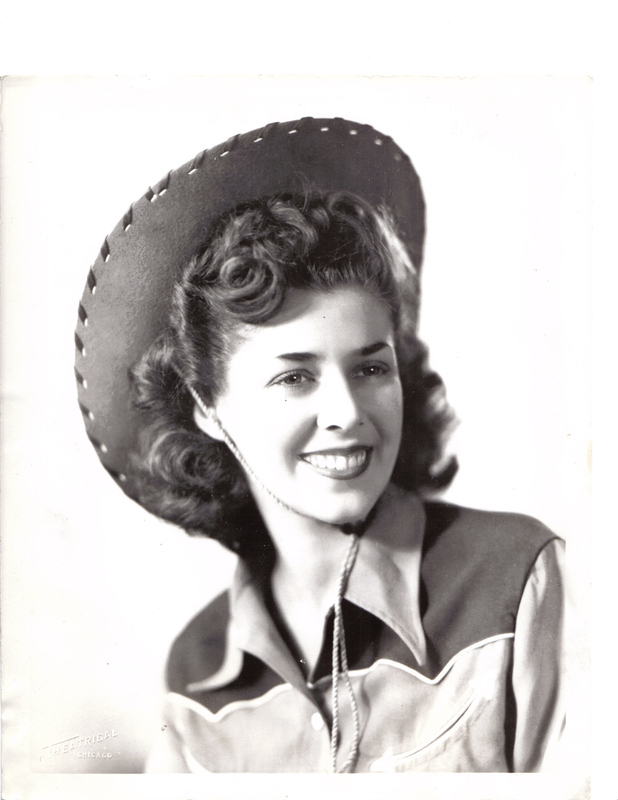 I recall the colorful and stylish western outfits of the performers. Most of all, I recall the opening number when Chuck counted off the downbeat and the group launched into a swinging western number, steel guitar soaring above all. I was so enthralled by that sudden rush of western swing melody that my behind must have elevated an inch or two off the seat at that precise moment! My younger sister and I never had much during those early years in terms of exposure to entertainment, the pleasures of eating-out, neat toys, and extra amenities. We did have two wonderful parents who loved us and slowly built a comfortable life after years of hard work. So…at that young age, the Circle-J experience hit me like a bolt of lightning. No one in our extended Chicago family had any musical background whatsoever, so the instant enlightenment brought about by the music and entertainment of that evening was deeply implanted within me. I never forgot the experience through all those years. I suppose the band’s gal vocalist, an exceptionally pretty woman named Helen Anderson, was the very first “crush” I ever had. I just thought she was beautiful, which she was, and she sang so “pretty.” I noticed her a lot, that evening! One other fascinating character on stage was the bass player, a fellow who had a very good comedic sense, an expressive face, and a bow-tie with electric lights that would flash on and off as he played and periodically twirled that big bass fiddle on its little spindle-stand. In many ways, the latter half of the forties was a great time in this country as people mobilized toward a new prosperity after sacrificing so much during the war. It was a simpler time than today in many ways, a time when a young lad like me from a working-class family could sit in the first ten rows at a western musical show in a large high school auditorium and be thrilled by the spectacle on stage. The entertainment environment was close and intimate – not like the high-priced, impersonal mega-concerts of today which too often feature more production and less pure talent. Thanks, Circle-J, for the wonderful experience! 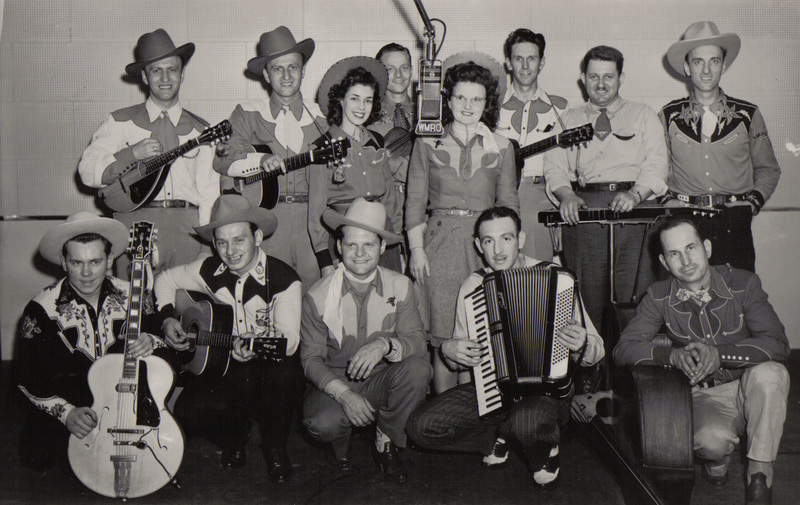 Note the bass player at right-front with bow tie; also note the steel guitar, second from the end, right-back row. How I do love the western sound of a steel guitar – rarely heard these days – until last year, when I heard the legendary Bobby Black at Santa Clarita; more on that in a future post on the Santa Clarita Cowboy Festival. The festival is an annual event held at Gene Autry’s sprawling old cowboy movie set located north-west of Los Angeles. My wife and I will, once again, be attending this year’s edition, and we look forward to more fantastic cowboy/western music and poetry. Our first time there nine years ago awakened, in me, many fond memories of Chicago and the Circle-J. This entry was posted in Music, Relections on Life and tagged Chicago, Chuck Maitzen, Circle-J Ranch, Clay Mason, cowboy festival, cowboy music, cowboy/western, Gene Autry, Helen Anderson, Melody Ranch, Santa Clarita, steel guitar, western music by Alan. Bookmark the permalink. Bob was my great Uncle. I miss him dearly. There are so many more beautiful pictures that should be shared. What a beautiful surprise! It is a pleasure to hear from you and of your connection to days long gone which, despite the many years, remain vivid in my mind. I exaggerate not in this post when I speak of the impact the Circle J had on my young sensibilities. Thank you for taking the time to comment. Chuck and Marion Maitzen were very good friends of my parents. I still have audio recordings from 1945/46 of myself (at six) and their daughter Judy. My dad and Chuck sang a duet of Red River Valley. This, at our apartment one evening using a machine that Chuck brought over which could make vinyl recordings. Of course, these have since been transferred by us to modern file formats. I am very interested in the “many pictures” you mention and would like to follow-up on those and the Maitzen history. Such a small world, these days! We were not lucky enough to enjoy “cowboy” music (not the same as country wrstern by a long shot) as children. Our first introduction was at the Bar J Ranch in Jackson Hole, WY. This was almost 40 years ago and we’ve LOVED “cowboy/Western swing” ever since. We can’t wait to enjoy the Santa Clarita Cowboy Music and Poetry Festival with you both! BTW, I’ve heard the differences between country western and cowboy music defined as the former takes place inside (love lost) and cowboy music takes place outside (ridin’ the range)! We actually like both! Thanks for clarifying the cowboy/western label, Linda. Thanks to you and Gil for persuading us to attend Santa Clarita with you several years back. Looking forward to yet another romp around Melody Ranch this year!